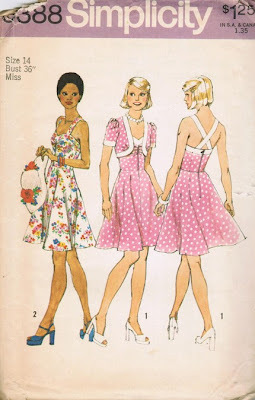 Gertie's New Blog for Better Sewing: The Seventies, Fifties Style! Or is the Fifties, Seventies style? Hmm. Anyhoo, isn't this 1974 Simplicity pattern interesting? It has elements of decades prior--the sweetheart neckline, the full skirt. But just look how the models are rocking it with the platform shoes! Love the hairstyles, too. 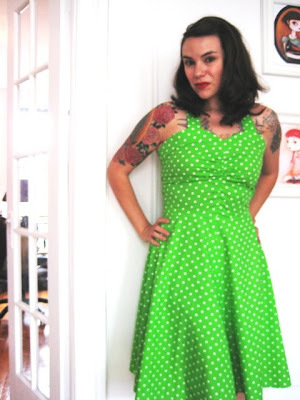 I made this up in a green and white polka dot poplin from Gorgeous Fabrics. I didn't change a thing about the pattern, and the fit worked out great! If I make it again, I'll probably add a little more ease to the waistline. One too many cupcakes and things could get a little dicey there. It could also stand to be taken in at the side seams of the bust. One experimental thing I did was to cut up a store-bought bra (it's one I don't wear very much) and sew it into the bodice. I tacked it on at the neckline facing, and stitched it on in the ditch of the side seams. I left the back of the bra intact so that I could hook it after I put the dress on (like how you hook a waist stay). I have to say, it's awesome. It's a nice way to get shape or support if you're in a pinch or can't find the right sew-in bra cups. I was going to show you a picture of the inside, but then I realized I'm too shy to show my unmentionables on the interwebs. I wore this out to dinner when my sweetheart and I had our wedding anniversary a few weeks ago (five years!). The lovely waitress effusively complimented the dress, and it was all I could do to not blurt out, "I MADE IT!" I just gave a very restrained "thank you" with a smile. How do all you other seamstresses handle compliments on your handmade clothing? Do you suppress the urge to tell the world that you created it? Or am I the only weirdo who does this? Oh, I love it! I just love that 70s retro look (ie, things that were retro back in the 70s). I have a 70s pattern I made up into the perfect little 40s-style dress, very Biba. I used to be shy about telling people I made something, but my husband always blurts it out for me if I do! Now I tell people, it's a great way to start a conversation. People are fascinated by sewing your own clothing and especially doing it well! The one time I sewed a dress that I wasn't ashamed to wear out, I probably told people who DIDN'T ask that I had made it! Yeah, just make sure that the people with you know that you made it and they'll pipe up with that info almost everytime. It's cool, you don't have to pay them a thing for free advertising! Your dress turned out beautifully! Fabulous dress, based on a terrific pattern. Definitely take the credit!! You rocked it! And the colour is great, too; for some reason, not many gals go for green, but tend to stick with the ubiquitous red and white or black and white. And I LOVE your lateral thinking re lining the bodice with a store-bought bra, and leaving the bra-band and hooks intact - kudos! what a great fitting dress. very nice. I ALWAYS blurt out 'I made it'! I went to a book signing a couple of years back for an author who I'm totally in love with. When I finally got to the front of the queue, he complimented me on my jacket and even then I blurted 'I made it'! It stems from a pride linked to childhood I think, when you show your mum something you made at school! I discovered this blog today (thank you google!!) and I LOVE what you're doing. I love the old books and I think home sewing really is beginning to be a dying art. I'm just beginning my quest for more knowledge, and since I'm an odd size and can't alter patterns for my damned life, I'm teaching myself to draft my own. So far I've got a princessline shirt dress that seems fairly accurately sized to myself and the flaws I can get away with because it's a Halloween costume. I've been searching for blogs like yours where people areactually making things and showing off their results! So THANKS. And your burda how tos are great. OMG! I just discovered your blog and have been reading the back posts. I made this pattern when it originally came out, when I was in high school!! Fabulous pattern, mine was made from a floral with contrasting white bands. The 70's was when retro really started to come on the scene--mostly 1930s and 1940s looks due to movies like Chinatown and Bonnie and Clyde. But I can definitely see the 1950s influence on this one. No--I'm the weirdo that blurts out I MADE IT to anyone standing near me! It's related to the fact that I like to talk about myself. Looks great. I've found a great late 70's blouse patten that can pass for 40's/50's with the right accessories.